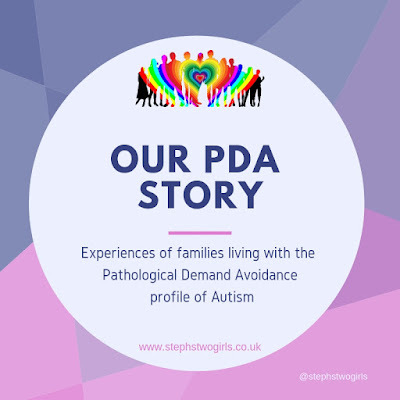 Welcome to week 6 of 'This is our PDA story', where I've been asking other families living with Pathological Demand Avoidance to share their thoughts and experiences. One of my favourite Facebook pages to follow is Pirates Go To Argos. Below she looks at the main aspect of PDA, anxiety. PDA and anxiety have a very close relationship in our house. My son has crippling anxiety and he creates a lot of anxiety. I love him unconditionally and would never be without him but being his caregiver has at times given me terrible anxiety. Living with PDA and it being unpredictable can leave you being on high alert at all times. Imagine you are floating in an ocean and you know that at anytime a dark storm can come. Even on the sunniest of days and swimming in the calmest of waters, experience causes you to not allow yourself to totally relax. You gently tread water, just about keeping your head above it aware that you are helping those you love swim as well as they hold onto you. You have to keep swimming as there are other people holding on and if you go under they will too. In fact you have been swimming like this for so long that you can't remember what dry land feels like. You used to be jealous of those people who were on dry and, seemingly taking it easy, but now you hardly even see them telling yourself how lucky you are to be in this beautiful sea and just forget about the dark clouds always looming in the background. Then suddenly without warning a huge wave comes along and engulfs you, sometimes you see it coming and sometimes it arrives with no warning....either way your reaction is the same. Your muscles tense, adrenaline kicks in, you start to shake, your heart beats quicker, your stomach starts to knot, you feel sick, your head starts to spin your breathing becomes shallow and quickens. For a split second you close your eyes in the hope it is not real, but the responses in your body show that it is not 'going to go away' and you use every ounce of strength you have left just to try and resurface above water. And of course you do, you have others holding onto you and you must resurface with them as well - you have no choice. But it is exhausting, treading water wears you out, waiting for the storm you know will come is draining, the physical symptoms that occur when the wave hits and the energy to push back up to the surface leaves you feeling as if you can do no more - but that is not an option. This waves come every day, some days have more than other days, but they are always there. Anxiety and exhaustion can be hidden well, but does not make them any less real - for PDA children and their loved ones it is a part of the package. This post is not about asking for sympathy, it's about explaining something that can't be seen. Please share and please help more people understand what being a caregiver of a child with special needs can be like.